First of all, what do I mean by “environmental language”? Environmental language, as I define it, is more than just the buzzwords we are so habituated to hearing and using. This language comes with a structure of argumentation. People expect that you present your environmental “facts” with a kind of scientific objectivity. Public arguments hinge on the causal relationships outlined between human action and negative impact: this human action will cause this environmental impact (insert scientific evidence here). Therefore, it is bad. Or the reverse: this change in our human action will cause a reduction or elimination of this negative environmental impact (insert scientific evidence here). Therefore, it is good. The following is a simple example of an environmental argument. I pulled these arguments from Mainstream Canada’s and the Friends of the Clayoquot Sound’s (FoCS) websites. These examples are meant to demonstrate that from a listener’s point of view both positions seem rational and scientifically reasonable. Yet, they make opposing claims on the impact of open net fishing. Mainstream Canada claims that placing open net aquacultures in strong currents allows the ocean floors to regenerate more efficiently. The strong current disperses the food and fish waste over a larger, yet still localized, surface area. The larger surface area reduces the smothering effect where the waste settles on the ocean floor. To further reduce their impact, Mainstream Canada cycles through their cages in order to allow the ocean floor to fully regenerate itself from the deposits. In their words: “Salmon waste and uneaten feed on the ocean floor can cause temporary oxygen reduction and other chemical changes as they decompose, and may cause an increase in the concentration of metals such as copper or zinc. 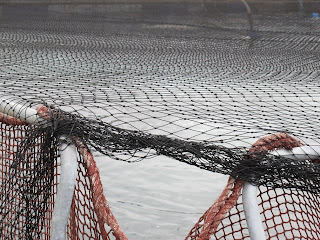 For this reason, salmon farms are situated in deep waters with sufficient current to disperse organic wastes” (Mainstream 2012). Being conscious of these impacts and structuring their practices in order to reduce and eliminate these environmental impacts, Mainstream Canada prides themselves for being sustainable. Where as FoCS claims that these strong tidal flows are an environmental hazard because the diseases and contaminants, that inevitably emerges from these cages, can travel kilometres. This increases the potential of infecting the wild salmon population: “because salmon farms are located in areas with strong tidal flow to disperse the feces from hundreds of thousands of fish contained in close proximity, these same tidal currents can spread viral particles many kilometres” (FoCS 2012). Concluding that Mainstream Canada is an unsustainable industry. 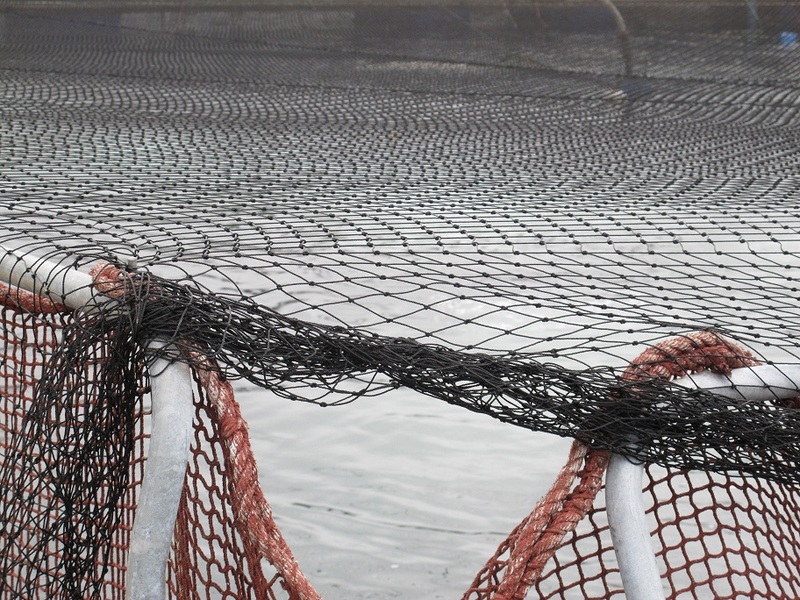 FoCS says: “There are many environmental and economic impacts associated with the practice of open net-cage salmon aquaculture, but of particular concern are a number of deadly salmon viruses” (FoCS 2012). Pay particular attention to the quotes provided and notice that the structure of the language is similar. Both parties have identified a causal relationship between a human action and a particular outcome. On the one hand, a strong tidal current disperses the organic wastes, and on the other strong tidal currents spreads diseases. The goal of this piece is not for you the reader to decide whose side you stand on, that is besides the point. The point is to make light of the fact that both parties use the same language in order to publicly present their argument. Let us be frank: the “science” behind these arguments is not the originating reason for these group’s passions. Mainstream Canada and FoCS have their own reasons for being present in our cultures, neither of which is in the name of science. Let us quickly identify the systems of values that can be found imbedded within the superficial language of environmentalism. Mainstream Canada defines sustainability as being able to “operate in such a way that [they] do not reduce the potential for future food production based on the same natural resources” (Mainstream 2012). They go on to say “sustainability is a goal that relies on balancing environmental, social and economic benefits and impacts, with a long-term commitment for continual improvement” (Mainstream 2012). There are two important ideas that I would like to draw from the above statements: 1) Mainstream Canada distinguishes the idea of environmental sustainability from the larger concept of sustainability. For Mainstream Canada, environmental is only one leg of the tripod model of sustainability and the environmental leg is largely to keep the two other legs standing. If aquaculture permanently and irrevocably damages ocean waters, then economic opportunities will be lost which will lead to un-employment and the chain reaction becomes socially and economically systemic. In other words, their values gravitate towards economic successes. On the other hand, FoCS have a very different philosophy of sustainability and it revolves around the idea of a pristine wilderness. In gross: if it was not there before, it should not be here at all. Therefore, anything people put in the ocean waters is un-sustainable. They act on visibility and aesthetics and strongly believe in the idea that nature knows best. This clash in system of values in environmentalism is analogous to the clash in the systems of values in politics. John Rawls points out in his article “The Idea of Public Reason Revisited” that a natural outcome of a “well ordered constitutional democratic society” (Rawls 765) is the idea of public reason. He says: “This is because a basic feature of democracy is the fact of reasonable pluralism—the fact that a plurality of conflicting reasonable comprehensive doctrines, religious, philosophical, and moral, is the normal result of its culture of free institutions” (Rawls 765-766). Basically, the idea of public reason is the idea that citizens need to have a universal and neutral language in order to discuss contentious issues, like environmentalism. An example provided by Rawls clarifies his position quite well. In 1784-1785 there was a famous debate between Patrick Henry and James Madison. This debate dealt with the question as to whether or not religion should be incorporated in public schools. The interesting aspect of this debate is the fact that it “was argued almost entirely by reference to political values alone” (Rawls 794). Christian knowledge was argued to be “an effective way to achieve basic political values, namely, the good and peaceable conduct of citizens” (Rawls 794). Christian knowledge was not defended to be “good in itself” because to argue on such grounds requires that the listeners are themselves Christians. For Rawls, it is only sensible and natural that politics, in a liberal democracy, has developed a shared language with its own structure of argumentation and jargon. This is no different in environmentalism. The voice of science seems to have been adopted as the universal voice, as it appears to be void of any particular system of value. In other words, it has become the public reason and that is why as listener’s we need to be attentive to an environmental argument. Superficially, they will all seem scientifically sound and rational. It is up to you to scratch the surface in order to have a better understanding of a particular position.